SAN FRANCISCO--(BUSINESS WIRE)--Disney and Lucasfilm today launched Star Wars Collectibles: Ultimate Studio Edition bringing an unprecedented level of authenticity to prop replica products for fans. 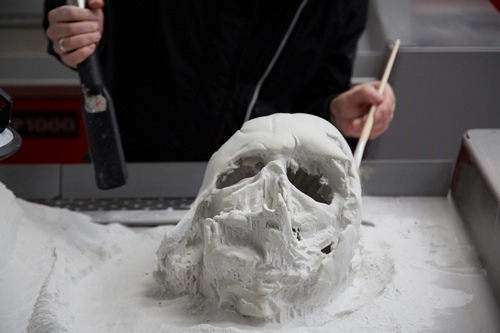 Made to order by propmakers at Propshop in Pinewood Studios using digital data collected during filming of Star Wars: The Force Awakens, the production process marries cutting-edge 3D printing technology with master craftsmanship to produce replicas virtually identical to those seen on screen. Available initially in the U.S., starwarsultimatestudioedition.com is the exclusive location to purchase these products. The initial offering from the Star Wars Collectibles line features eight prop replicas from Star Wars: The Force Awakens, including Darth Vader’s melted helmet, Rey’s lightsaber hilt, FN-2187 Stormtrooper helmet and more. Each replica item is a limited production piece due to the high level of craftsmanship required to create them. These made-to-order replicas will come with custom display pedestals, packed in branded wooden crates that are inspired by the real crates used to ship the film props. Each one is custom built to accommodate the shape of the replica inside. Visit Disney’s YouTube channel to view the latest installment of their “Boxed” series to get a behind-the-scenes look at Darth Vader’s melted helmet being created; then tune in each month to see reveals of new items added to the Star Wars Collectibles: Ultimate Studio Edition line. For more information, visit starwarsultimatestudioedition.com. Disney Consumer Products and Interactive Media (DCPI) is the business segment of The Walt Disney Company (NYSE:DIS) that brings our Company's stories and characters to life through innovative and engaging physical products and digital experiences across more than 100 categories, from toys and t-shirts, to apps, books and console games. DCPI comprises two main lines of business: Disney Consumer Products (DCP), and Disney Interactive (DI). The combined segment is home to world class teams of app and game developers, licensing and retail experts, a leading retail business (Disney Store), artists and storytellers, and technologists who inspire imaginations around the world. Propshop is a digital and physical asset production company providing film productions and wider audiences with data acquisition, 3D conceptual design, and manufacturing facilities. Known for its ability to bring ideas to life both digitally and physically, Propshop combines the latest technologies with traditional craftsmanship, producing unique artifacts for film, promotion and consumer products. Propshop, Propshop Studio Editions, the Propshop logos and other related properties are trade marks and/or copyrights, in the United Kingdom, United States and other countries, owned by Propshop Productions Limited. © & TM Propshop Productions Limited. STAR WARS, and related properties and character names are trademarks and/or copyrights, in the United States and other countries, of Lucasfilm Ltd. and/or its affiliates. © & TM Lucasfilm Ltd.